Chaz Davies fought his way back to fourth at Imola after early problem. Chaz Davies saw his hopes of a fifth straight victory at Imola ended after a nightmare start to his World Superbikes race. The Knighton-born rider had qualified in third spot on the Italian track despite crashing in the Superpole battle. But Davies struggled at the lights dropping back to seventh before climbing back into fourth spot. Then Davies went straight through the Variante Bassa chicane, losing several more positions along the way and any chance of a victory. 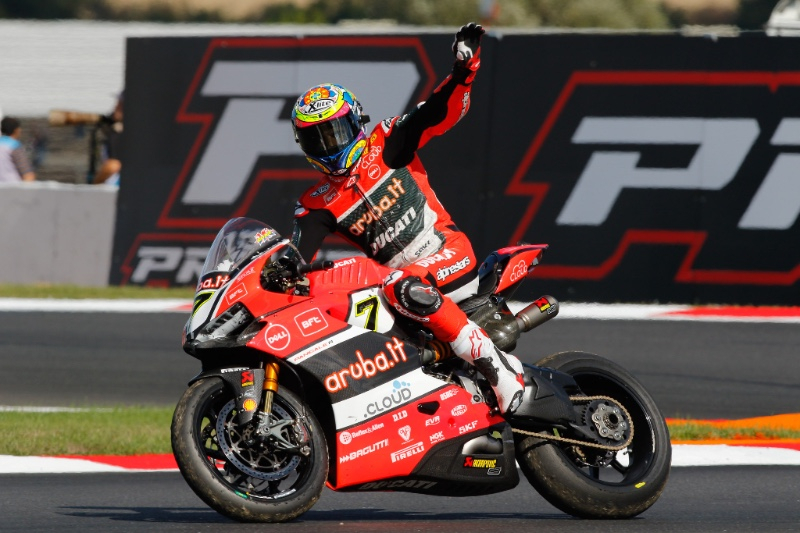 Davies showed why he has such a strong record in recent years on what is a home track for his aruba.it Racing Ducati team as he made several sweeping overtaking moves. But the 31-year-old had to settle for fourth spot just over eight seconds behind race winner Jonathan Rea who claimed the 58th victory of his career. That left the reigning three-time champ from Ulster just one win away from equalling the all-time record of 59 World Superbike wins set by Britain’s carl Fogarty. Rea’s Kawasaki team-mate Tom Sykes was second with Davies’ fellow Ducati rider Marco Melandri third. Jonathan Rea takes 58th career win to extend World Superbikes title lead. Davies is still second in the World Championship standings but 42 points behind Rea. But Davies will have the advantage of starting on pole for Sunday’s race as per the regulations which mixes-up the grid line-up from Saturday’s race. Davies said: “We couldn’t get a good start, then I went straight at the last chicane so I had quite a bit of catching p to do after that. “In the end our pace was really good so I think we could have fought for the podium if not the win, but we came through just a little too late. Rd 5: Italian (Imola) Qual: 3rd.